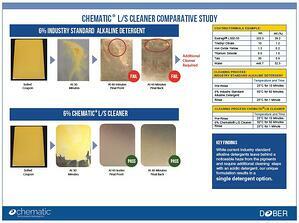 Chematic's custom formulated detergents optimize cleaning results with minimum efforts. Take advantage of this special detergent system, which targets removal of both the Eudragit polymers and associated excipients. In 2013, Evonik partnered with Dober, a leading pharmaceutical detergent company, to develop unique detergents targeting the EUDRAGIT® polymers and associated excipients. The result of this collaboration is a Chematic® detergent line specially formulated to clean equipment after manufacturing with EUDRAGIT® polymers. 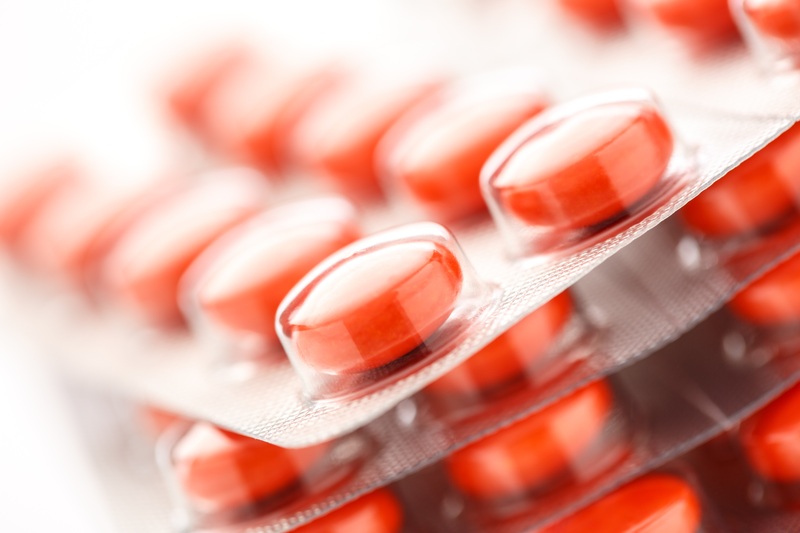 EUDRAGIT® Polymers are applied as high-performance film coatings or matrices to address your specific drug delivery requirements. These proprietary polymers are best cleaned with proprietary cleaning solutions. EUDRAGIT® L, S, and FS series polymer and pigment combination often requires multiple steps or re-cleaning multiple times. Chematic ® L, L/S, and L/S Plus formulated detergents are specialty cleaners developed for the removal of these EUDRAGIT® enteric polymers and associated coatings found in pharmaceutical manufacturing operations. 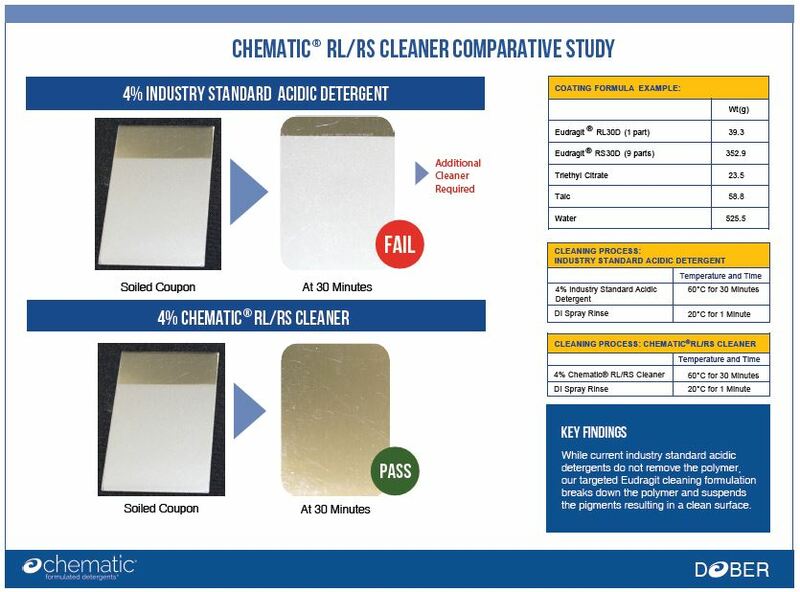 Chematic®'s formulated detergent eliminates the need for re-cleaning by readily penetrating and removing the multiple layers of product and polymer associated with the use of these coatings in both manual and CIP applications. Chematic ® L Series detergents are also effective at removing the colored pigments often found in these coatings like talc, iron oxide, and titanium dioxide. EUDRAGIT® NE and NM are pH independent which is problematic for traditional cleaning methods because you can't just lean on an alkaline or acidic approach in isolation. 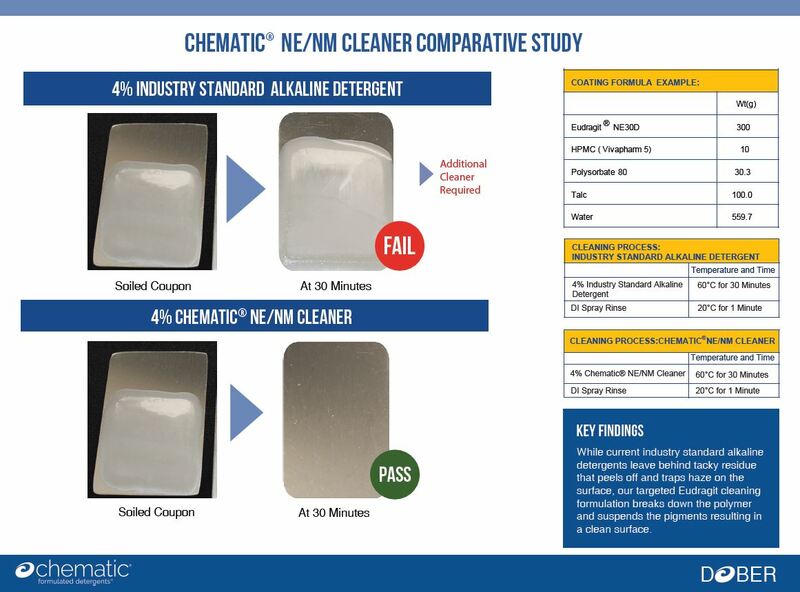 Chematic® NE/NM formulated detergent is a specialty cleaner developed for the removal of these EUDRAGIT® enteric polymers and associated coatings found in pharmaceutical manufacturing operations. 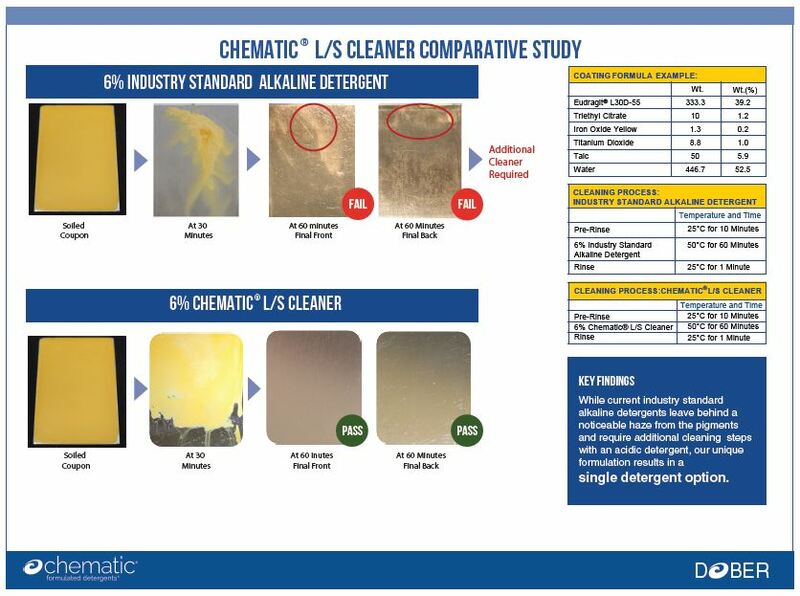 Chematic®'s formulated detergent eliminates the need for re-cleaning by readily penetrating and removing the multiple layers of product and polymer associated with the use of these coatings in both manual and CIP applications. EUDRAGIT® RL and RS are pH independent which is problematic for traditional cleaning methods because you can't just lean on an alkaline or acidic approach in isolation. Chematic® RL/RS is a formulated detergent developed for the removal of these EUDRAGIT® enteric polymers and associated coatings from equipment found in pharmaceutical manufacturing operations. Have More Cleaning Questions? Get in touch with our Cleaning Specialists!